Hello there! 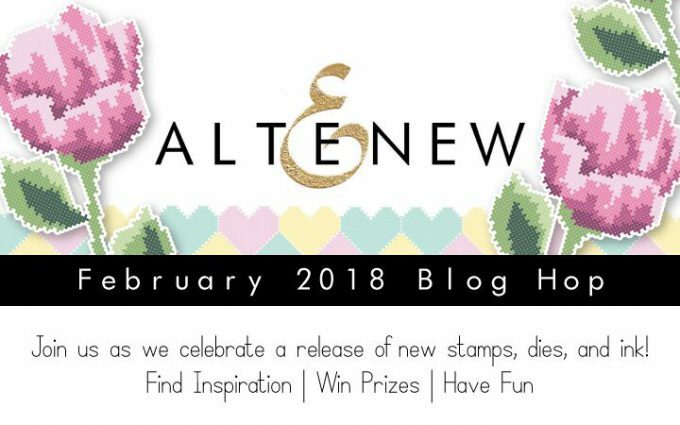 Thank you for stopping by to help celebrate new release from Altenew for February 2018. This post is a part of a celebratory blog hop (more about the hop and giveaways below). 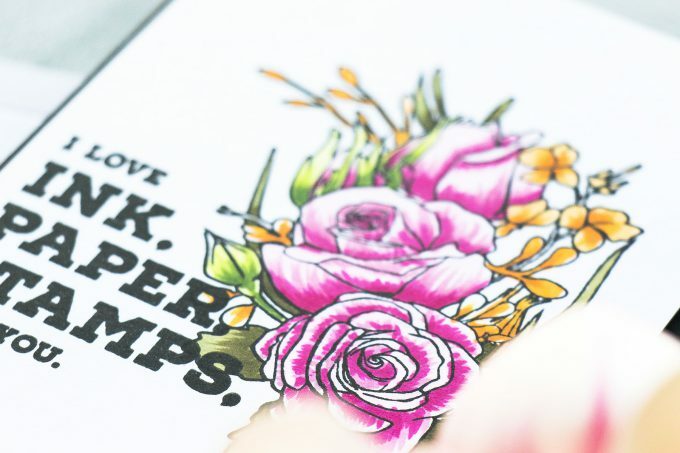 Today I’m sharing a new to me way to color florals with Copic or other Alcohol markers. This is nothing new, but it’s something that I have recently discovered as I was playing with my markers and tried to come up with a fun way to color flowers. 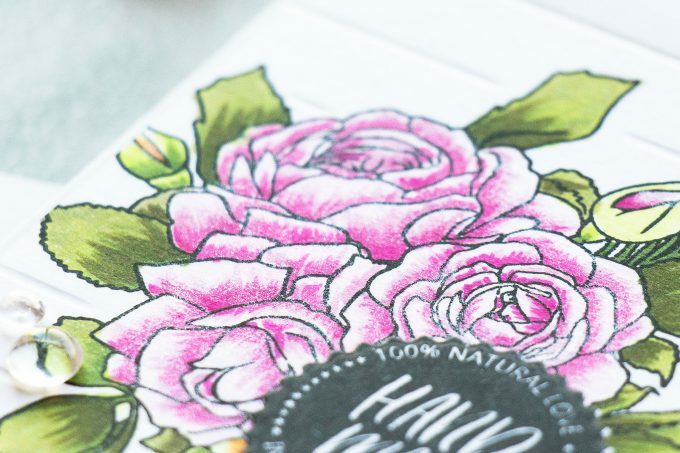 I also recently watched a video by Janette for Hero Arts about Flick Style coloring with pencils and her video has inspired my to try flicking with my Copics (visit Janette’s blog for more inspiration). 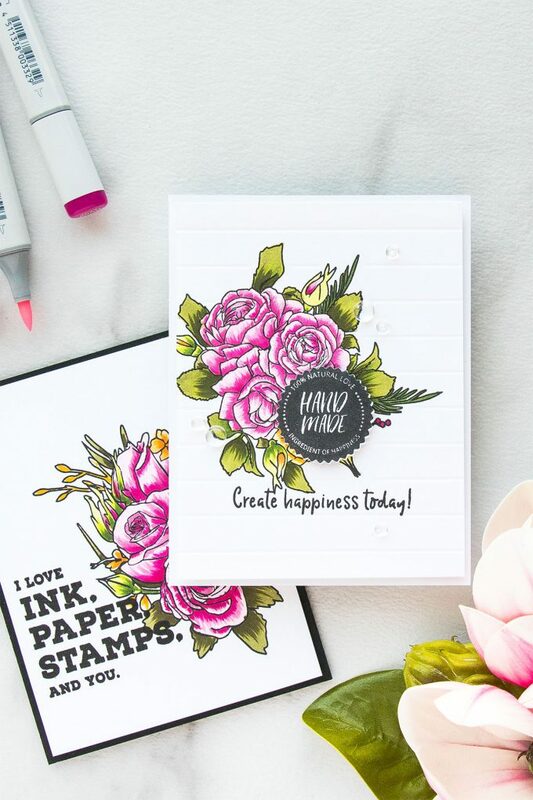 I started working on my projects by stamping beautiful floral images from a new stamp set by Altenew – Forever and Always in Simon Says Stamp Intense Black ink into onto Neenah Solar White cardstock. I used the flick style coloring to color the flowers and leaves. The colors I used were RV00, RV34 and RV09. I applied my lightest color RV00 and I just colored the entire flower in. Next, I used my medium color, RV34 and flicked where the petals need to be darker, so I added shading to each petal. As I was coloring this I did notice that it’s best to let each layer of marker dry completely, so that the flicks do not blend together, but rather remain crisp and sharp. I’ve also found that for me it is easiest to flick in one direction, so instead of turning my hand I was rotating the paper. Once I had my medium color flicked on, I can came in with the darkest color and flick it on as well. This coloring method worked really well for me for coloring these small flowers. The petals, especially those in the center of the flower were so small it would have been impossible to do proper blending, so I am happy I discovered this flicking technique. I used just 3 colors for my coloring today, but I can also see myself using more colors, especially if the petals are a bit larger. This kind of coloring was also a bit inspired by Altenew layering images – some of their floral images have layers that mimic these flicks. Once my coloring was done I added horizontal scoring to my background avoiding the stamped area – I’ve been using this technique for several month now and I’m still loving it. It is a bit hand on the hand especially if you score a bunch of backgrounds, but I think the end result is so totally worth it. Watch THIS VIDEO to learn more about it. Next, I stamped and die cut Hand Made using the stamp and die from the Crafty Life stamp set and also stamped Create Happiness Today in black ink onto one of the scored sections of my background. 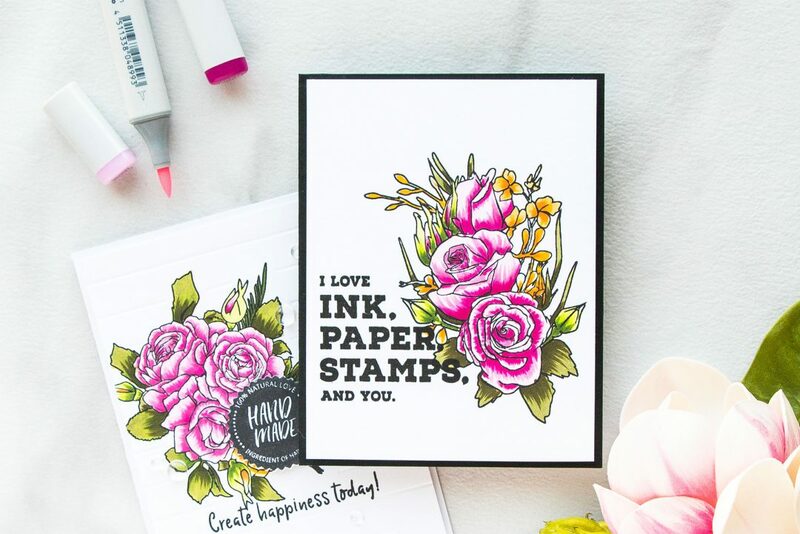 I used my Simon Says Stamp Intense Black ink for stamping the sentiment as this is the kind of ink I used to stamp my flower outline and I like my inks to match for projects like this. Finally, I trimmed my background to 4 x 5 1/4″ and foam mounted onto an A2 card base. 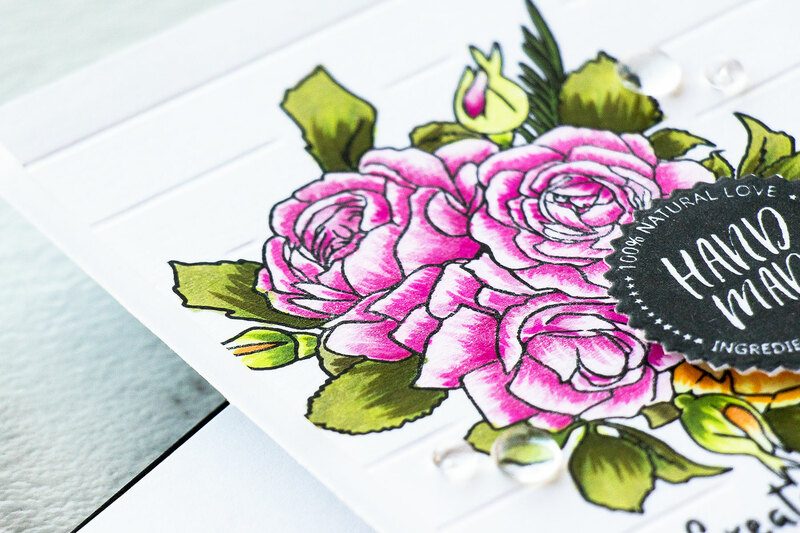 I foam mounted the Handmade die cut and also used clear droplets from Pretty Pink Posh to embellish this card. I wanted to keep it very simple and have the floral arrangement be the center of attention. I did foam mount the Hand Made die cut over one of the colored flowers – the yellow one. I did that for a few reasons. First, I wanted this cluster to have just 3 flowers, the 4th one looked a bit odd and it was distracting. Second, I didn’t like how I colored the yellow flower, my flicks were too big and it just didn’t look right. Third, I couldn’t find any better spot for this die cut – simple as that! I also created one more card using another floral cluster from the Forever and Always stamp set. I did the exact same thing here in terms of stamping and coloring, For my sentiment I once again using the Crafty Life stamp set and I stamped I Love Ink, Paper, Stamps and You in black ink. I trimmed my panel and foam mounted onto a black card base for a lot of contrast. The next stop on this hop is Yoonsun Hur. You can also start over at the Altenew Card blog. Are you on Pinterest? I’d love for your to pin this project if you like it! Thanks! Your card turned out really beautiful. Your cards are absolutely luscious! I really need to watch Janette’s video so I can learn how it works! Thanks for the inspiration! I love how effortless you made this look, even though I’d probably just end up with a mess if I tried it.. The scoring technique is amazing. Lovely cards, overall! Yana, this is stunning! I’m eager to try this out. You always inspire me! 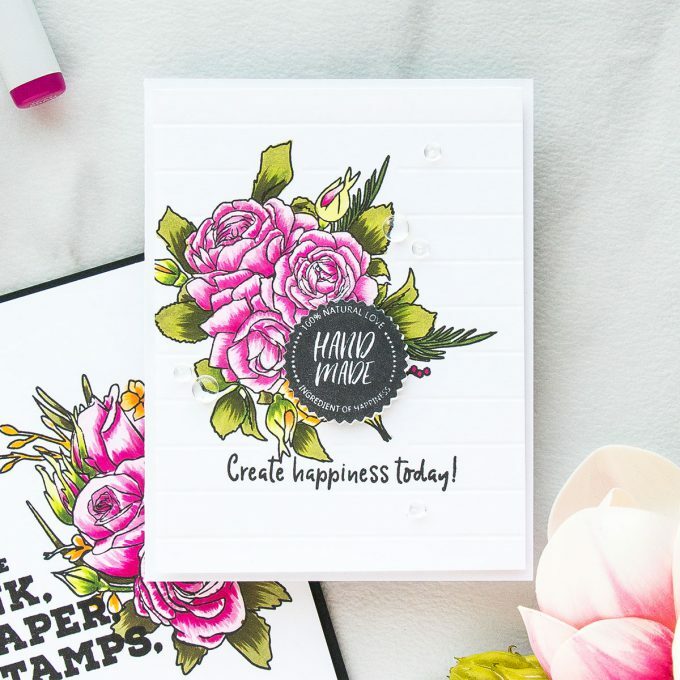 Love the details on the flowers, and the crafty sentiments! Loved your video on the flicking technique, will be trying it soon. I am so loving what you did with your cards and especially how you used my favorite color in the whole wide world, yellow. I have to check out you’re flicking technique because even though I’ve never heard of it, I like how it looks. Thanks for showing your pretty flower cards and for showing us a new technique to try. Also thanks for giving us the chance to win something. With all the winter weather, I am looking forward to seeing some flowers in my life. So very lovely! 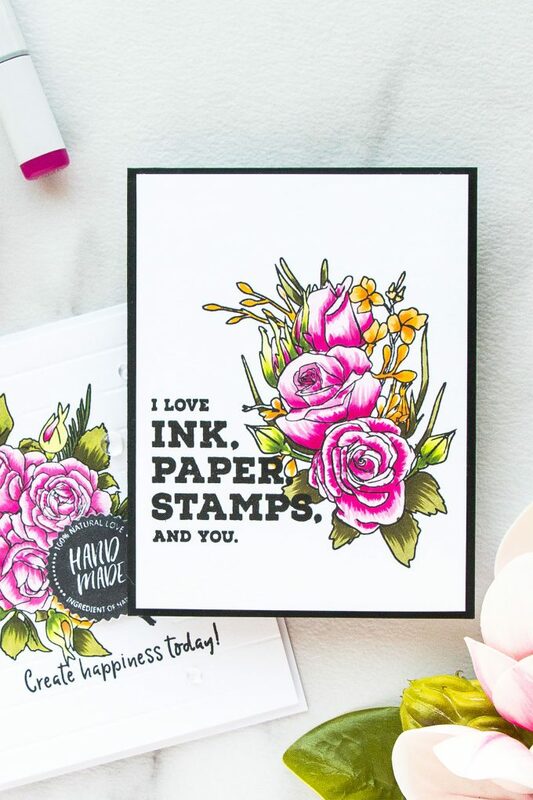 The coloring is wonderful and the sentiments are perfect! Thanks so much for sharing and inspiring! Oh my goodness, this card is beautiful! It makes me want this set so much!! Beautiful card! Love all your creative ideas and great video! I think you did a great job with the flick technique! Lovely cards. I have used both techniques in the past but needed to be reminded how they look. Thank you. Thanks so much for your video! Now I gotta try your “flick” coloring method. Very pretty cards as well. Gorgeous cards Yana! I love that flicking technique! I try it all the time, but it was very helpful watching you do it! Thanks for a great video! I have learned so much from you! LOVE the flicks! Definitely adds texture and depth to the flowers! SO beautiful!!! So pretty! 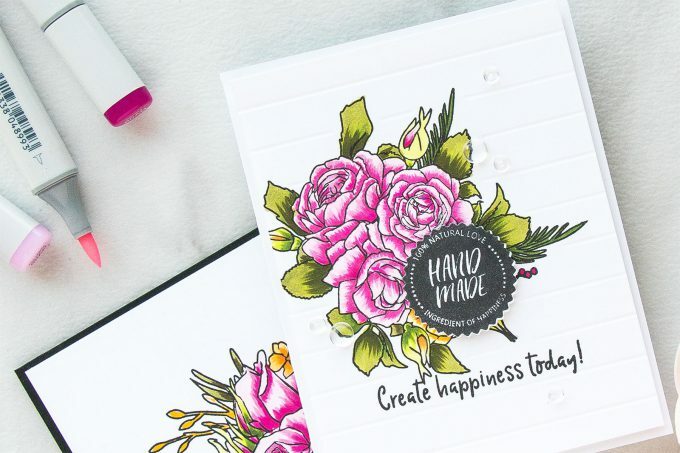 I love this technique – am pulling out my copics to try! Great new technique and great job coloring. I wish I had some copics to try technique. I do have some tombow markers to try this technique. I really like the look of the flicking technique! Just gorgeous!!! I want to try that coloring technique-awesome video!! Wow, your card is stunning! Amazing coloring. Love the flicking technique for coloring. Your video makes it looks so easy! I’ve yet to master flicking with coloring but your video has inspired me to keep trying! Your cards are beautiful, modern and crisp. The scoring is simple but adds a nice wow factor. Thanks for the inspiration. You coloured these flowers just beautifully. The flicking technique really adds interest and some dimension. You’d never quess it was your first þime trying this technique. I love the scored backgrounds touch been doing. It adds interest without sistracting from the focal image. I love it!! Beautiful card, Yana! I am intrigued by the ‘flicking’ technique & am anxious to try it! Very pretty card and nice technique. 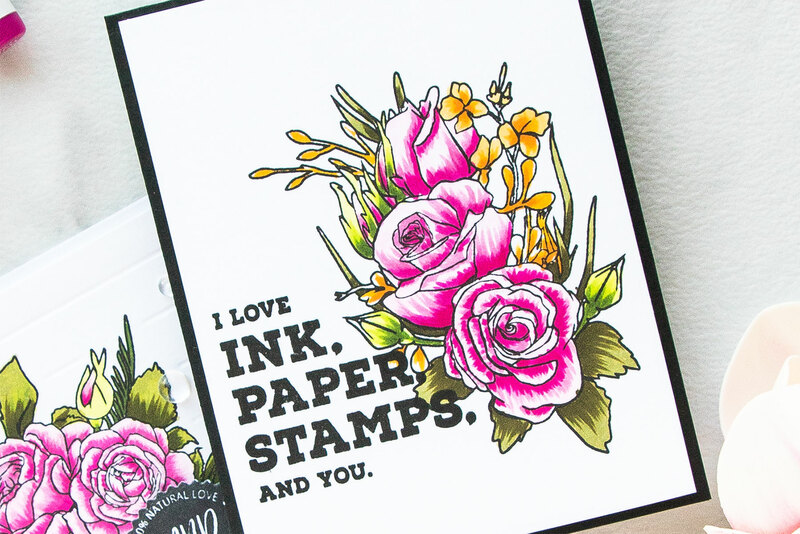 Beautiful stamp, your coloring does it justice. Lovely flowers colors are gorgeous! Such cool cards! Thanks for ideas for backgrounds and coloring methods! Wow gorgeous cards! I love the white on white one! I think I’m going to have to try the flicking technique. It looks so pretty. Your cards are impeccable and your instructions ate the best! Thank you.